I'm the kind of chef who chops up whatever the local bazaar has that week, adds a random amount of seasonings until the color suits my fancy and then cooks it. Somehow. Most days I don't go hungry. The other day, fresh garlic was really cheap so I bought a bunch. The housewares shop had some little jugs with corks, so I picked one up. 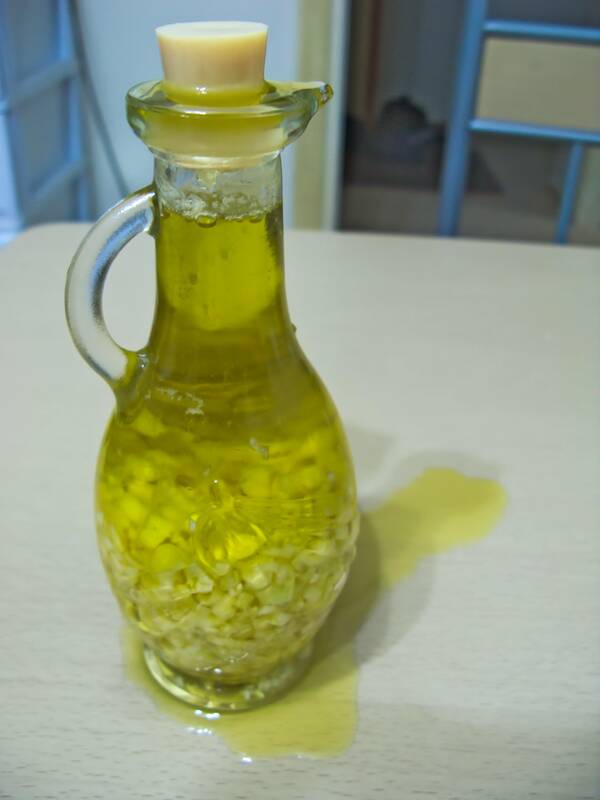 Back at home I chopped up a few heads of garlic, stuffed it the jug, then filled the jug with olive oil. Bread for the next two days had had a great dipping sauce! However dipping bread in oil uses up a lot of oil and not very much garlic, so on the second evening when it was about half empty I topped off the jug with fresh oil. I corked it, wiped off the drips from around the top with a paper towel and left it on the table. I am certain when I corked it the level of oil was below the bottom of the cork because I tipped it to see how the garlic was getting an and remember the air moving around in the jug. I am also certain the top was clean having wiped it off, and of course there was no puddle. Even stranger, as I have left it there today it has continued to drip. Casual kitchen tinkerer: How should I safely store my garlic and olive oil? Is there danger to storing this in something that seals better than a plastic cork? Is it safe to eat? Amateur chemist: Is there a chemical reaction going on between the garlic and the oil? Would it ever explode? Wannabe physicist: How did the oil get out? This seems like a gravity defying stunt. Note the current oil level is about ½" below the cork. Somebody please tell me why my day's adventure at the bazaar made this much mess and how to make yummy things with garlic and olive oil safely! It is unsafe, as the other posts already mentioned, due to botulism danger. Plant matter without access to oxygen is not shelf stable, unless it has been pickled with sufficient acid. There will be some chemistry going on between garlic and oil, but not much of it. Most of it will be solubility stuff; some reactions will probably happen too, but nothing you will notice. Most important, there will be no oil-garlic explosions. The results you are seeing are most likely caused by some microorganism (bacteria or yeast) gorging itself on the sugars in your garlic and burping out some gas, probably CO2. There is nothing strange about the gas building enough pressure to get a bit of oil out. Brewers can tell you that you never stopper a bottle or carboy in which something is undergoing primary fermentation, else your cork blows out or the whole vessel shatters. If you ever popped a champagne bottle, you know how much force you can get in there. The gas from the fermentation could not dissolve in the oil (the way it would had happened with CO2 in a watery medium). It built up pressure against the cork. I suspect that the cork was not perfectly tight, else it'd have shot out. Instead, the foam probably pushed it up a bit until it could flow around it, and got out. The pressure fell, and the remaining oil stayed in the bottle. As to making yummy oil with garlic safely, TonyArra already told you: you can keep it in the fridge and eat it up within a few days. Don't top it up with new oil! It is perishable just like mayonnaise or milk, but the ugly part about it is that you won't notice anything if there is a lively botulinum colony in there. No off smells, color changes or similar. Most bacteria which live in food don't survive without oxygen (c. botulinum is an exception) and the ones which make food smell bad will not be present even if you have botulinum in your oil. If you want something which keeps, look into recipes which require pickling or freezing. You won't be able to get a garlic oil with them, but maybe a garlic spread will work for your bread too. I would throw it away quickly. Making garlic oil is a huge risk for botulism (botulism is a bacteria that thrives in food when there's a lack of oxygen, as is the case with garlic submerged in olive oil). You CAN make garlic-infused olive oil, but it's best to keep it in the fridge to prevent the botulism from growing. They say that it's difficult to tell when botulism has developed in food, but the air bubbles could very well be caused by the bacteria (anaerobic bacteria usually expel CO2). Edit: it's true that this is most likely not botulinum bacteria, but even if it IS fermentation, this means that you've have thriving anaerobic bacteria inside your oil, and thus botulism is a sincere threat here. Botulism CAN cause paralysis and even death, so if you haven't been properly refrigerating your garlic oil, it's not worth the risk. It should be stored at or below 36F/2C. At this temperature, the oil may start to solidify, so it might be necessary to take the oil out a little in advance before using it. It should never be kept out for more than 4 hours at room temperature. First of all: I am not very familiar with fermentation. Therefore I cannot give you any advice as to whether your oil is still edible or not. Could it be capillary action that caused the oil overflow? If I remember rightly PC enthusiasts who submerge a whole PC into an aquarium with cooking oil (for cooling) always have the problem that oil "climbs" the cables. Not the answer you're looking for? Browse other questions tagged food-safety storage-method food-science garlic olive-oil or ask your own question. whats the best way to bottle home made condiments and spice rubs? How can I infuse olive oil safely?